Vibrating sieve is a basic equipment for verity of industrial, which is efficiently and capable of all types of screening operations for particles, powder, viscous liquid products. Our Vibratory sieve is definitely a good helper in different fields including chemical engineering, medicine, metal metallurgy, food processing, ceramics, coating material and pollutant treatments. This Vibrating Sieve machine is driven by vertical electric motor. An upper and lower adjustable eccentric weighted arm controls the motion of the unit. These weights can be adjusted to suit nearly every need required by the industrial screening market place. Moreover, vertical motion model is perfectly functioning in limited space, special model with adjustable gate devices aims to keep clean and accurate in separation by controlling outlet ports, special spout model has an enlarged top inlet port, which reaches high efficiency of screening operation. Sieving rate: more than 95%. 25 years experience of it. Application of vibrating sieve It applies to food, pharmacy, chemical, products, ceramic, powder, metallurgy, plastics. Rubber. Grinding and other industries. Rotary Separators is a self- contained equipment working on the principle of gyratory motion using low powered motor. It separates bulk solid materials from solids and slurries, utilizing multi-plane, inertial vibration that causes particles to pass through apertures in the screen or to travel across the screen surface in controlled pathways. Screening machines have been adopted advanced techniques high sophisticated screening equipment. It consists of ultrasonic producer and vibrating sieve. It’s an important breakthrough in screening efficiency. Screening machines separator adopts advanced intelligent vibrating ultrasonic controller and has solved many problems caused by single frequency, truly realizing the reasonable combination of ultrasonic function and vibrating sieve. Screening machines is driven by vertical electric motor. An upper and lower adjustable eccentric weighted arm controls the motion of the unit. These weights can be adjusted to suit nearly every need required by the industrial screening market place. 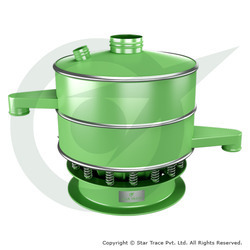 Moreover, vertical motion model is perfectly functioning in limited space, special model with adjustable gate devices aims to keep clean and accurate in separation by controlling outlet ports, special spout model has an enlarged top inlet port, which reaches high efficiency of screening operation. Circular vibrating screen from Star Trace adopt new type dynamic generator, making three dimension powers more obviously and successfully,making the scale of processed materials enlarged.Accordingly this makes Circular vibrating screens capable of processing various kinds of materials. Circular vibrating screen vertical motor, which is installed eccentric hammers on the top and bottom, is regarded as a vibratory source.The eccentric hammers change rotation into horizontal, vertical and inclined movement, and then pass the movement to the sieving surface. Adjusting the phase angle on the top and bottom can change trajectories of the materials on the sieve. No jam for the screen net, no powders flying around and no liquid leaking out when running, fully sealed structure and environmentally friendly. It only takes 3~5 MINS to replace and clean the net conveniently. Easy to operate our Circular vibrating screens, impurities and coarse materials can be discharged automatically, continuous operations. 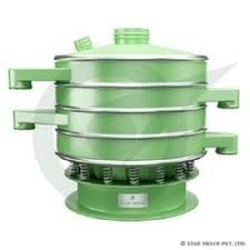 Star Trace Vibro screens is three-dimensional and multi-functional. Generally it has three main applications called classification or sieving; solid-liquid separation or filteration; washing and cleaning.Vibro screens widely used in chemical, abrasive, ceramic, pharmaceutical, papermaking, metallurgy, mining, food industry,etc. Its vertical motor, which is installed eccentric hammers on the top and bottom, is regarded as a vibratory source. The eccentric hammers change rotation into horizontal, vertical and inclined movement, and then pass the movement to the sieving surface. Adjusting the phase angle on the top and bottom can change trajectories of the materials on the sieve. Tea Separator is a universal device designed with full demonstrability and utmost optimization and have the tend to be standardized. It is very suitable to separate small particle, minuteness powder and the separation of solid and liquid. This Tea Separator is one of precised powder sieve,it is of high efficiency,and the screening accuracy exceeds 90%. It adopts whole sealing structure design,the sealed effect is fairly well,no dust pollution,no leaking liquid,no material left in machine,and no dead angle in the net frame. Small volume and light weight,easy to be installed and maintained. The outlet can be adjusted at any angle,and it is easy to replace the screen. the rubber ball device can reduce the changce of jam on the screen. By adding the device ultrasonic instrument conversion device, superfine materials up to 600 mesh can be sieved. Looking for Screen Separators ?